Is Pinkerton, a place that has gone to the deuce. And every spring it is hit by a flood......."
The river has been diked and floods are a thing of the past, but the attractive little village of Pinkerton remains as a tangible reminder of a pioneer family who played an important role in the original settlement of southern Bruce County. Though the Pinkerton family name in Bruce has declined in numbers, many other families can claim a relationship through marriage. This article will tell the story of the three original pioneers who came to the Queen's Bush in the earliest days. These were two brothers and a sister, Henry Pinkerton, David Pinkerton and Jane (Pinkerton) Walker. Each of these people with their spouses and families made a major contribution to the early clearing and development of the land. Their stories will be told in the order of their arrival in Bruce. The account begins, as usual, with immigration. Before crossing the Atlantic, the Pinkertons lived in Ireland. Family tradition recalls that in earlier centuries they migrated first from England to Scotland and later to Ireland, following population shifts of the time. Our story begins in Northern Ireland, in the 1820's, where James Pinkerton and his family began to plan a move to the new world. At this point James was a man in his early sixties with a grown family of 5 boys and 3 girls. Some of these family members were themselves married with young families. They lived in County Antrim around the town of Ballymoney, in the parish of Seacon. They probably migrated in two or more groups, but by 1829, most were settled on farms in King Township, York County, Upper Canada near the village of Lloydtown. James Pinkerton, the patriarch, lived to the age of 96 and his grave is in the Pioneer Cemetery at Lloydtown. This cemetery also contains graves of several of his family, including his wife Jane, and sons Samuel and Matthew, who lived out their lives in the vicinity. The three people who are the subject of this story lived in the Lloydtown area too, until the early 1850's, when they once again felt the need to move on. The reasons for this second move are not known for certain, but it is probable that as their families grew, there was not enough land available in York County for the young people to farm. New tracts of Crown land farther north were being opened for settlement and the prospect of free land and other opportunities would have been enough incentive for them to again face the rigors of pioneering. Jane, the youngest daughter of James Pinkerton, was born in Ireland about 1809. She came to Canada with other family members in the 1820's. Another early family to settle in King Township were the Walkers, who were said to have come from County Tyrone in Ireland. 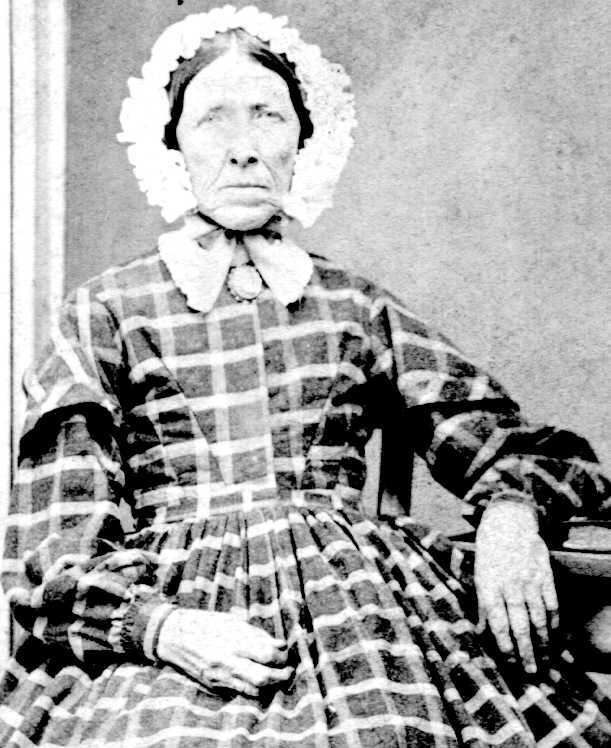 Jane married Joseph Walker around 1827 and three children are known, William, James and Joseph H. A fourth child, Mary Jane Martin, an orphan, was raised by the Walkers. Joseph Walker achieved much prominence in Bruce County in later years. As sometimes happens, his wife was overshadowed by this and we have little biographical information about her. It is known that she accompanied her husband and family in their move to the settlement that became Walkerton, and lived there for the balance of her life. The story of Joseph Walker, founder of Walkerton, has been told many times and need not be repeated at great length here. A few of the main details seem appropriate, however. Walker is said to have been a miller in York County. In 1850 he became interested in the Queen's Bush. He began to explore it on foot and realized the potential of the site that was later to be named after him, i.e. Walkerton. He built a log cabin near the Saugeen River and began the construction of a dam. In 1851 he completed a sawmill, utilizing the power from this dam. By 1853 he had raised capital and completed a grist mill as well. He built himself a substantial stone residence which still exists. He also took title to much of the surrounding land, and had it surveyed and laid out as a town site. For the next few years, Walker was quite prosperous. However, this did not last. In 1858, the country experienced a serious depression, and Walker found himself overextended financially. By 1863, he had to sell off almost all his holdings. To add to his woes, his wife, Jane Pinkerton, died the following year. Walker never did recoup his losses, but he continued to take a leading part in the affairs of Walkerton. He was deeply involved in the nine year struggle to choose the county town of Bruce and was ultimately successful in having Walkerton achieve that honour in 1867. In this struggle, it is interesting to note that both Pinkerton and Greenock village, at one time or another, were suggested as county town sites. This would seem to have placed Walker at odds with his wife's two brothers, however, there is no record of any animosity in family accounts. Walker went to Manitoulin Island in 1870 to make a fresh start. He established a flour mill but died in 1873, aged 72, without having achieved any great success. The family of Joseph and Jane Walker eventually left Walkerton to live their lives elsewhere. They seem to have maintained some contact, however. A news item in the Walkerton Herald-Times of May 17, 1928, mentions a visit by son, Joseph H. Walker, then over 70 and living in Kitchener. As far as is known, there are no direct descendants in the town nowadays. The foster daughter, Mary Jane Martin, married Andrew Bell and raised a large family in Brant Township. In 1852 Henry Pinkerton would have been 47 years of age and his 12 children ranged in age from George at 22 down to David, a babe of 2 years. (A baby girl is also listed in the Census, but, as she is not included in the family Bible, it is not certain that she was a family member.) Another child, Samuel, was born later, in 1855. One can only marvel at the courage of these people, particularly Eliza, who undertook the enormous hardship of travelling through the bush to a primitive settlement with a huge family, and ending up in a log cabin no larger than a modern 2-car garage -- with winter coming on!. The book, Greenock Township History 1856 - 1981, has recorded Crown Deeds issued in the Township. This listing shows that Henry Pinkerton took title to Lot 70 NDR and Lot 70 SDR, across the road. Several of his sons also held land. James Pinkerton took Lot 69 SDR and 65 NDR. Other holdings were Robert Pinkerton at Lot 66, William at Lot 67, and George at Lot 68, all on the North side. The ownership of these lots changed in later years. For example: the 1861 Agricultural census shows Henry's widow Eliza at Lots 69 & 70 and Robert at Lots 67 & 68. The first few years would have been devoted to the heavy labour of forest clearance and the beginning of farming. However, by 1854 Henry found time to serve as councillor on the first Greenock Township Council. Unfortunately, his term was short since he died in January of the following year. This left his widow Eliza with many small children. In fact her youngest, Samuel was born several months after his father's death. The prospect must have been an unenviable one, but with the help of her older sons and daughters, she survived and raised them all. A family photo taken around 1890 shows her as an old lady in a group with her son David and several of his family. She lived until 1897, dying at age 86. 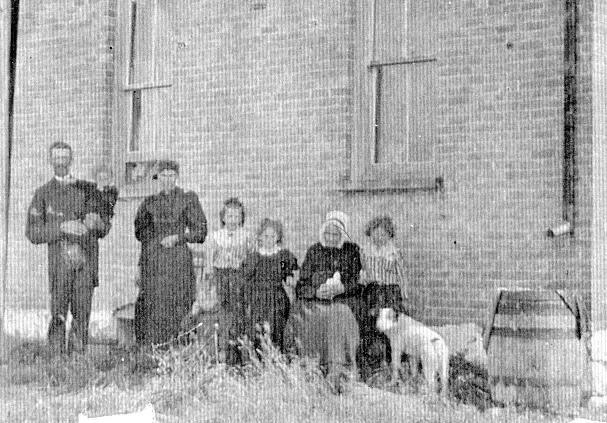 Family of David Pinkerton, Greenock, ON, about 1890. The old lady at the right is Eliza, pioneer and widow of Henry Pinkerton. Today there are no direct descendants of Henry and Eliza living in Bruce, and little verbal history has survived. The large family gradually dispersed or died out. We believe that Jane (I), Jane (II), Elizabeth and Samuel died young or were unmarried. Samuel joined the old 32nd Battalion raised to fight the Northwest Rebellion of 1885. He did not see action and died two years later. Two other sons, George and David, lived their entire lives in Greenock. The others, Mary Ann (Sheridan), William, Robert, James, Joseph, Henry Jr. and John all eventually left the area to settle elsewhere. We can comment briefly on the lives of several of these people from records that have survived. George Pinkerton remained in Greenock Township until his death in 1890. He married Mary Ann Ritchie of Greenock, and there were six children. This family suffered a disaster in 1864 when four of the children died within a few weeks of each other, evidently from one of the epidemics which occurred in the area. The sad little tombstone can still be seen in the cairn at the pioneer Methodist Cemetery in the centre of Greenock village. The family of the other brother, David, was more fortunate. David married Margaret Spence and they lived out their lives a short distance east of Greenock village. There were 5 girls and 3 boys. Of these, Nelson, William, John and Eliza, all unmarried, remained in the area and were the last Pinkertons of this branch to live in Bruce County. The family farm, Lots 67 & 68 NDR, was sold about 1970. The other family members moved on a various times and there is now little trace of their movements. We know that William Pinkerton moved to Michigan around 1868 and family members lived around Saginaw and Frankenmuth. His sister Mary Ann (Pinkerton) Sheridan may also have lived in Michigan for a time, and it is believed a daughter later lived in California. Henry Jr. moved to Dakota and later to Manitoba where he lived the balance of his life. The final destinations of James and Joseph are unknown. John Pinkerton lived for a time in Greenock Township. He and his wife Elizabeth Vint had several children, three of whom appear to have met the same fate as the family of George Pinkerton. They died young and their stone is also in the old Methodist Cemetery in Greenock village. No other information is available about John, except that he and Henry Jr. were twins. Considerably more information survives on the remaining brother, Robert Pinkerton. He played a leading role in early councils of Greenock Township. Between 1863 and 1871 he held the position of Reeve for 7 terms and Councillor for one. Robert married Margaret Montgomery and had a family of seven boys and one girl. Margaret died in 1881 and the family moved to Walkerton the same year. This family escaped the epidemics that decimated their cousins and grew to adulthood. They dispersed in the 1880's and several members moved to North Dakota. It is known that one son, Allan, was a prominent sheriff in that state. Later descendants moved on to California. 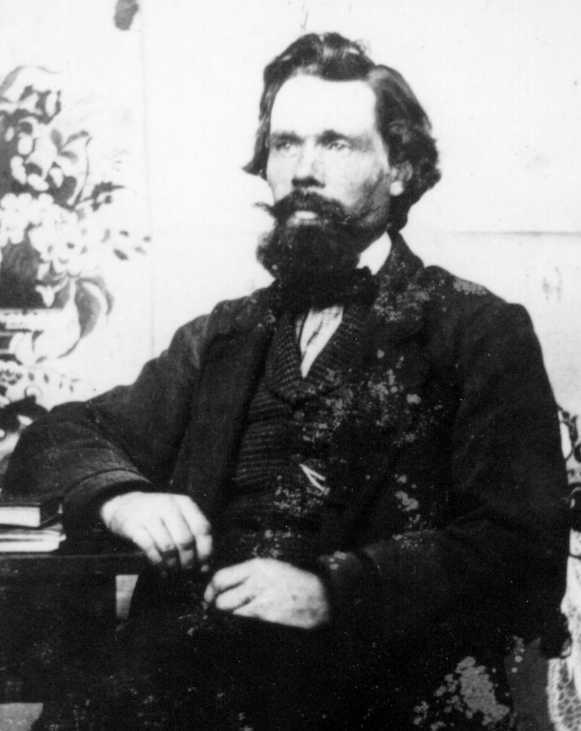 Robert Pinkerton later left Walkerton for the West. It appears that he married a second time but nothing is known of this wife. He turned up in British Columbia where he was married for a third time in 1895 to Maria M. Hawes. There were two sons from this marriage. The older son, Robert Hasell Pinkerton, was well known in Vancouver as a Deputy Fire Chief. His father died in 1903 after a busy 70 years. David Pinkerton followed his brother Henry to Greenock Twp. in 1854, no doubt influenced by reports which would have filtered back to Lloydtown from Greenock. At this time David and his wife Mary Ann would have been about 56 years old. Their family consisted of 6 boys and 2 girls. The oldest son, John, did not accompany the others to Bruce in 1854. John was already married with young children, and the records show that he farmed near Aurora until the early 1870's. In later years he spent some time in Pinkerton and also resided in the Clifford area. He was buried at Pinkerton in the old Greenwood Cemetery. The older daughter, Mary, born 1831 at Lloydtown, appears to have died very young, and the name was used again with the second girl, Mary Jane. The other sons - James, Matthew, Henry, Joseph and Thomas, as well as Mary Jane all settled in Greenock Twp. as pioneers. One of the amusing and sometimes confusing aspects of family histories is the problem of first names and how the same ones seem to reappear with every new generation. Not only did several of David's sons bear the same names as his brother Henry's boys, but the names appeared in previous generations and in later families. All the writer can do is to caution readers to beware of identical names. Even experienced genealogists have been known to err in these circumstances. 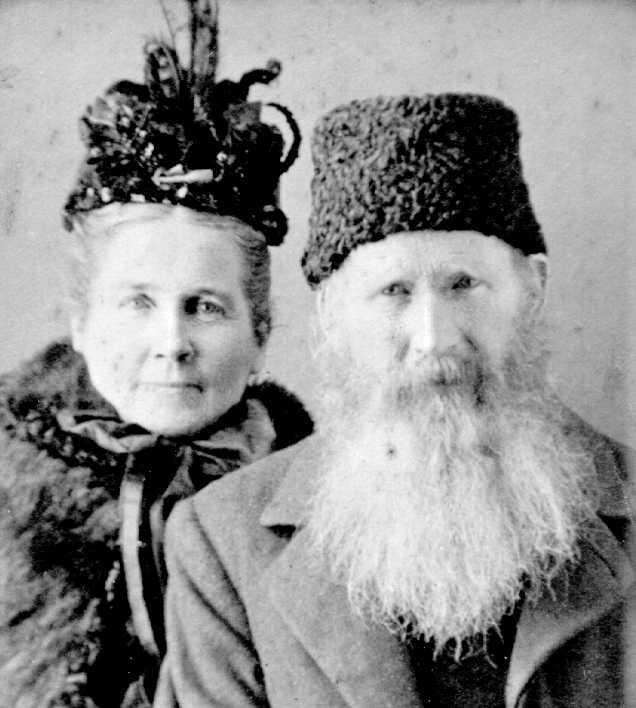 David and Mary Ann Pinkerton, founders of Pinkerton Village. One of the first settlers in Greenock was one John Shennan, who discovered a promising power site on a local river. This river, known as the Yokassippi, later the Mud and finally the Teeswater, runs through the length of Greenock Twp. Shennan began to develop the site in 1853 beginning a dam and sawmill. David Pinkerton purchased the site the following year and completed the construction with the help of his sons. David's pattern of settlement was similar to his brother-in-law Joseph Walker's. He and his family developed industries, a town plan and a substantial holding in surrounding farm land. In addition to the dam and sawmill, they built a grist mill, a carding mill, a hotel and several houses. At the same time, they took title to about 1200 acres of the surrounding land. The emerging village was first called Davidsville after the founder. However, in 1860 a Post Office was established and given the name of Pinkerton which became the village's permanent name. David's son Matthew was the first postmaster. The first log cabin of 1854 was used by the family until other homes were built. This measured 16 x 24 feet and was located in what is now the centre of the village. It still survives although it is now partly enclosed by later additions. A second cabin was built by David's son Henry on Lot 1, Con. 12, overlooking the dam. This cabin was later demolished when Henry built a newer house farther west on the farm. That house in turn was replaced early in the 20th century by Henry's son David, and remains in the family to this day. James Pinkerton built a small timber frame house on the hilltop overlooking the flour mill. This house burned about 20 years ago. David built a house across the road, on the site of the present Birrell home, but it burned in 1867. Matthew Pinkerton operated the first hotel, which was built on river lowland just west of the sawmill. He hired a young woman, Mary Bell, as barmaid, and she later became his wife. In 1862 Matthew moved out of the hotel and built a house of local limestone, in the centre of the village near the original cabin. This house has remained in the Pinkerton family until the present time. Matthew's brother Thomas then moved into the hotel building and converted it to his private home. This building survived until 1993, when it was seriously damaged by fire and subsequently demolished. The sawmill operated for many years. It was sold in 1897 by Thomas Pinkerton to Stewart Brothers. It continued to operate with some additions and modernization until it was destroyed by fire in 1912, At that time it was owned by J.B. Campbell and Albert Pinkerton, David's grandson. The flour mill operated with stone mill wheels and an overshot water wheel. David Pinkerton brought in George Elphick, an experienced miller from York County, to operate the mill. The mill was sold to George Elphick in the 1870s by then owner Joseph Pinkerton, David's son. In 1896 the original mill caught fire and burned. A second more modern mill was begun by George Elphick, equipped with roller mills. Elphick died before it was finished, and the mill was sold to Thomas Edgar and later to M.L. Ziegler. In 1903 the mill was bought by Thomas Birrell. Three generations of Birrells, Thomas, Wesley, and Harold ran the mill for nearly 80 years. The second mill lasted until 1928 when fire again struck as a result of lightning. The third mill, built by Wes Birrell, is still operating as a feed mill, and is now part of the New-Life Mills organization. The carding mill was probably built a few years after first settlement, when sheep raising had become more common. Thomas Pinkerton operated the mill until the early years of the 20th century. By then, the rise of modern textile factories made this pioneer mill uneconomic. David Pinkerton lived the balance of his life in this village which bears his name. He died in 1874 at the age of 75. He was buried on land overlooking the village, part of Lot 1, Con. 13, then owned by Thomas Pinkerton. The village at that time had no cemetery, and after David's death, the 1 1/5 acre plot surrounding his grave was purchased and established as Greenwood Cemetery. The stones of David and his son John can still be seen at the site. David's widow Mary Ann lived until 1887. Her burial place is not marked, but, in all likelihood, she too was buried in Greenwood. As mentioned before, John Pinkerton remained in York County for many years. His wife was Sarah Sloan and they had 10 children. Sometime in the 1870s they left York and ended up at the village of Clifford in Wellington County. John died in 1879. His family dispersed, and some settled in Grey County. David's second son, James Pinkerton came to Greenock Township with the family and originally took title to three farm lots in the Pinkerton area. These lots were those through which the Teeswater River flowed. As mentioned, he built a timber frame house on the centre lot, Lot 1, Con. 13, but did not settle there permanently. He sold Lot 1, Con. 12 to his brother Henry, Lot 1, Con. 13 to his brothers Thomas and Joseph, and the third lot on Con. 14 to Alex McKee. He worked for a time in the Pinkerton flour mill. He married Margrie Cameron and there were seven children. They eventually moved to a farm east of the village of Glammis, which had been the property of his father-in-law, Alex Cameron, and remained there for the rest of their lives. This farm has a fine brick house, built about 1900. The story is told that Arthur, the oldest son of James and Margrie, went to the Klondike gold rush. He came home with a considerable fortune and built the new home as a gift for his father and mother. Descendants of James' son Alec, who later owned this farm, still live in Bruce. Matthew Pinkerton, the third son, arrived at Pinkerton as a young man and held a variety of positions. He was listed as pound keeper in 1859, as postmaster in 1860, and as tavern keeper in 1861 at the original hotel. He was chairman of the committee which set up Greenwood Cemetery in 1874. In the end Matthew became a farmer. He acquired Lot 1, Con. 13 from his brothers Thomas and Joseph, plus Lot 2 beside it from his father. Matthew and his wife Mary had no family. They lived in the stone house erected at the front of the farm, until 1899, when they retired and moved to Walkerton. The farm was sold to Matthew's nephews, David and Alexander Pinkerton. The farm was later sold in 1925 to their nephews, Gordon and Harvey Pinkerton. For many years, the Pinkerton Fall Fair was held on grounds leased from Matthew and the later owners. The old exhibition building, "The Palace", still stands on the farm. Henry, the fourth son, was the last of David Pinkerton's family to be born in Ireland and he was brought to Canada as an infant in 1829. He married Margaret Jane McKee in the spring of 1854, a few weeks before the family moved to Bruce. Margaret was said to be the first woman to arrive in the village. When they first arrived Henry was placed in charge of operating the newly completed sawmill. As noted before, the family took title to 1200 acres of land around the village. These properties were traded around among the family members and Henry became the owner of Lots 1 & 2, Con. 12. He settled on this farm and began the labour of clearing it. Unfortunately, he died a tragic death in the winter of 1864. He left behind his wife and five children, all under the age of 10. (A sixth child died shortly after birth.) The widow persevered after this catastrophe and, with family help, was able to keep the farm. Her two oldest sons, David and Alexander (Sandy), were thrust into a responsible role at an early age, and took over the farm as young men. The farm still remains in the hands of descendants. (It is interesting to note that in later years, this David's daughter Ethel married Wesley Birrell, son of Thomas Birrell the owner of the flour mill, renewing the association of a Pinkerton with the mill.) Another son Albert worked for a time in the flour mill and later operated the general store. Albert and his family moved into the old stone house built by Matthew Pinkerton. This house and the adjoining farm are also still held by Pinkerton descendants. The fourth child, Joseph, married and eventually moved to Oregon. The daughter Jane married Alex Cameron, brother of Margrie Cameron, mentioned above. Jane died young, survived by a daughter. Her granddaughter was Jean, wife of the late Dr. Donald Milne, prominent Paisley physician. The remaining family of David and Mary Ann Pinkerton were born in Canada, in King Township. The fifth son, Joseph, came to Pinkerton as a young man, with the family. Joseph became owner of a farm on Con. A, immediately to the east of the village. He also operated the flour mill for a time and sold it to George Elphick in the 1870s. Joe's wife was Eliza Jane Moore and they had eight children. Their oldest son, William joined the 32nd Battalion of the Canadian Militia, which was raised to help quell the Northwest Rebellion of 1885. The Battalion was not needed and never left Bruce county. However, William went to Manitoba on his own shortly afterwards. He influenced his father and the family to move there. They settled around Killarney where Joe had interests in farming and flour milling. He was also one of the first bee-keepers in Manitoba. His original hives of bees came from Pinkerton, from his brother Matthew who also kept bees. By that time the new Canadian Pacific Railway made such shipments easy. Joseph's family remained in Western Canada. Thomas Pinkerton was the sixth son and spent his entire life in the village. He had many interests. In addition to managing both the sawmill and the carding mill for many years, he farmed and owned a house and general store in Eden Grove, a short distance east of Pinkerton. He was also the first secretary-treasurer of the local Fall Fair and provided the land for the creation of Greenwood Cemetery. He became the owner of the first log cabin and in 1873 arranged to give it to the destitute wife of Wm. McCormick, a local hotel-keeper who had left Pinkerton suddenly for the Caribou Gold rush in British Columbia. It was stipulated that Mrs. McCormick return the house when it was no longer needed. This occurred on the death of her stepdaughter Jennie in 1957 when the old house was returned to the Pinkerton family in Jennie's will. Thomas Pinkerton married Mary Ann Bradley in 1861 and they had a family of 7 boys and 3 girls. None of the boys remained in Pinkerton. William and Thomas Jr. went to Toronto. John, Frank, George, Lorne, and Sydney are all believed to have gone to western Canada. One daughter, Gertrude, died young. The other girls, Frances and Lena, became nurses. Frances married and lived in the U.S.A. In 1917 Lena married James Douglas, well known in Hepworth, ON. 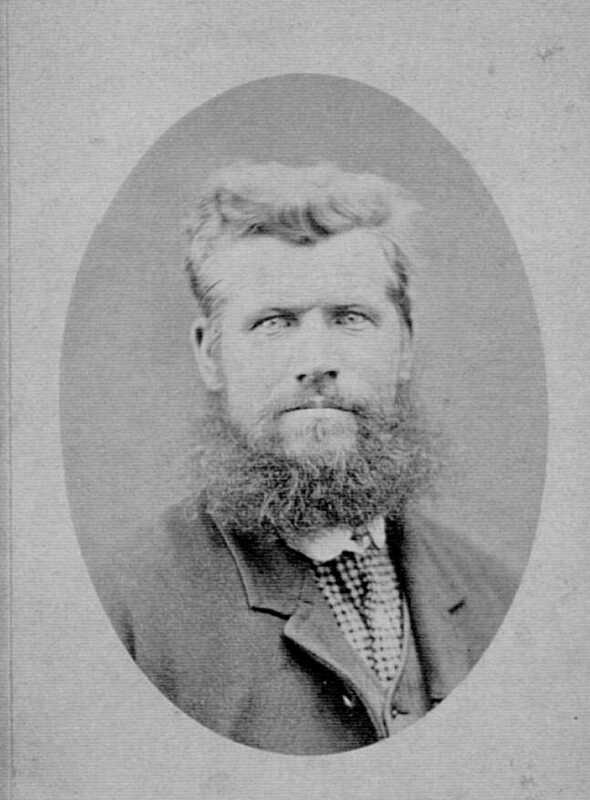 Thomas Pinkerton died in 1908. A diary he kept that year has survived. It shows him living an active life. Among other things, he speaks of breaking up the old equipment in the carding mill for fire wood! There are entries until two days before he died, so it is evident that his death at 70 was sudden. His wife died in 1914. David and Mary Ann Pinkerton's youngest child, Mary Jane, was born at Lloydtown in 1841. She was 13 when she arrived in Bruce and four years later married George Elphick. As mentioned previously, George had been invited to come to Pinkerton from York County, to operate the new flour mill which Mary Jane's father had just completed. In 1867 George purchased the mill at nearby Yokassippi, now Cargill. He sold this mill in 1872 and about the same time, bought the Pinkerton mill which he operated for the rest of his life. George and Mary Jane made their home on a farm just west of the village, at Lot 3, Con. 12 of Greenock. They had a family of 10 children, 8 girls and 2 boys. There are many descendants of this family in the vicinity of Pinkerton and the farm remains in Elphick hands after four generations. Mary Jane died in 1909. This sums up the story of the Pinkertons as Bruce County pioneers. The author is indebted to several descendants and other interested persons, for many of the genealogical details, which are already becoming hard to find. These persons include Nina Black of Barrie, Lois Leggott of Penticton, Rick Beltrame of Waterdown, Irene Douglas of St. Thomas, Bruce Huntley of California and the late Gordon Pinkerton of Pinkerton. Note to readers: This article relates to the Pinkertons in Bruce County, Ontario, Canada. This article was first published in the 1998 Yearbook of the Bruce County Historical Society. The Bruce County Historical Society can be contacted c/o Mrs. Donelda MacKinnon, Box 202, Tiverton Ontario, Canada, N0G 2T0. Note to readers: Geoff Pinkerton scanned the original manuscript as kindly provided by Jim Connell, who gave permission to publish this manuscript on the Pinkerton Resource Page. Two obvious spelling mistakes were corrected. Geoff used optical character recognition software and then proofread the document. Geoff Pinkerton (geoffpinkerton@hotmail.com) is the coordinator of this page.